A. No man can have ten heads. It is said in Ramayana that as soon as Ramaâ€™s arrows cut off one of Ravanaâ€™s heads, a new head used to spring up in the place of the severed one. Actually there was one real head and other nine were artificial ones fitted on to the body. This was Ravanaâ€™s stratagem for self- defense. 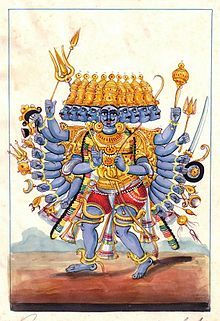 Ravana. had studied the four Vedas and six systems of philosophy and yet he was a malevolent soul despite his learning the ten Shastras as mentioned above.